So pancakes. I think part of the lack of pancakes in my diet is that I eat them, stuff myself silly, and then two hours later I’m starving again. Not to mention that my mom only made Swedish pancakes (though if she were to make American pancakes, wouldn’t they still be “Swedish” since she’s, you know, Swedish? Food for thought.) 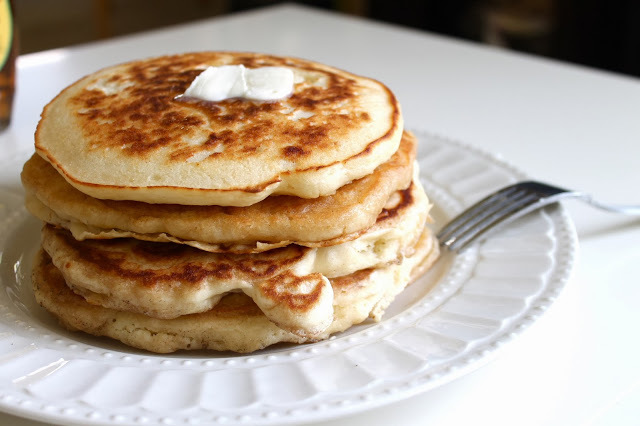 and it was my dad that would make the thick fluffy American pancakes. But since he didn’t often cook, my brother and I would have to beg him to make pancakes on a rare Saturday or Sunday. Good (and delicious) memories. Eventually, my brother took over the pancake making because let’s face it, what carb-loading pancake-loving boy wouldn’t want to make a huge stack of pancakes all for himself? Now I have to beg him to make pancakes, which is always obliges. This recipe is from him. I’m not sure where he found it, but I’m excited to see where I can go from here. Pumpkin pancakes? 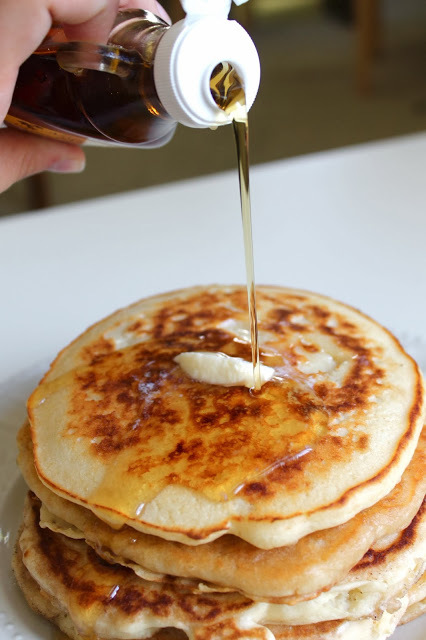 Caramel pancakes? Chocolate pancakes? Oh my god I can’t believe I forgot to mention the whole reason I made these and blogged about them. My brain is all over the place. Last week, it rained. It RAINED in LA. It hasn’t rained since I moved here February 10th. There were puddles, windshield wipers were on, I wore a raincoat and boots. I was in loooooove. Oh my god. It was literally one of my happiest days. 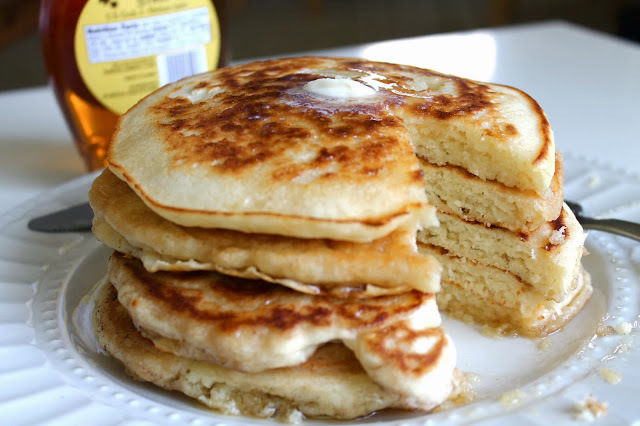 So, of course, when I got home from work I made these pancakes which were a perfect comfort food on a cold rainy day. 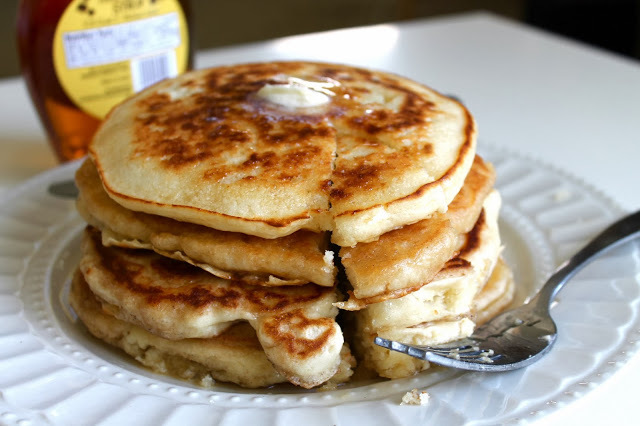 Now, as the weather cools down and as a reward for making it through this scatter-brained post, make some pancakes. Comfort yourself. In a medium sized mixing bowl, whisk the egg. Add in the milk, melted butter, and vanilla. Stir in flour, salt, and baking powder until just combined. Lumps are okay! If batter is too thick, add in additional milk 1/4 cup at a time. These are awesome! You made my day posting about my recipe! !